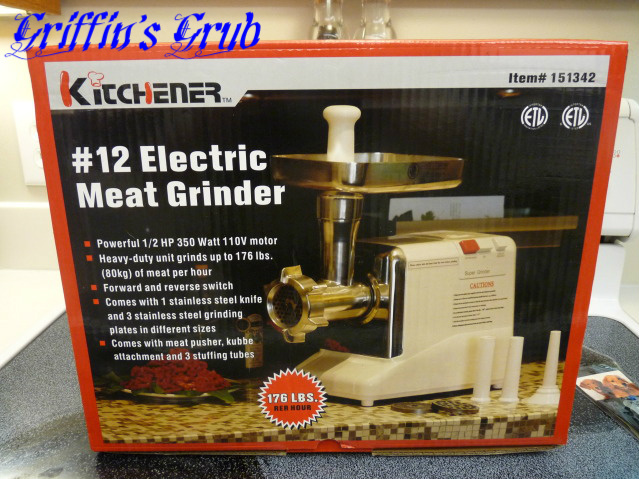 So you read Basic Meat Grinding Part 1, and now you are thinking about grinding your own meat. You’re probably asking yourself, “How much is this going to cost?” Believe it or not, only about $100. Most of the stuff you need, you probably already have at home in your kitchen. Let’s talk about that grinder. The one I am using is a Kitchener #12 from Northern Tools and is pictured above. As of 7/16/13, they have it listed on their site for $99.99. We’ve been using it for a little over a year and half now and have never had a problem with it. The box claims that it can grind 176 lbs per hour, which comes out to about 3 lbs per minute. I don’t know if this is accurate, as I’ve never timed it myself. Generally, I do batches of about 5 to 10 lbs and it seems like it takes about 5 to 10 minutes. Quick enough that all the metals parts are still ice cold from being frozen before grinding (we’ll get into why cold is important later). I’ve also heard really good things about the LEM #8 grinder, which can be found at Academy for the same price. I’ve never used it, but people say it’s a quality product and if their sausage stuffer I use is any indication, I would believe them. I will caution that this grinder is for home use, you might even call it an “entry level” grinder. 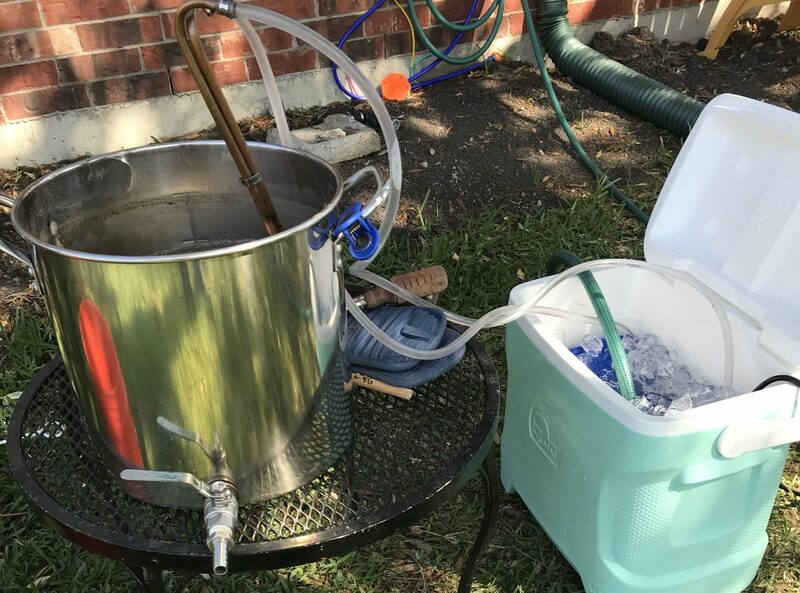 If you are doing small batches, it will serve you fine. I couldn’t say how large your batches would be before you might run into problems, but if you are grinding meat for an army, you might want to pony up a little more cash and spring for a larger model that has more horsepower. Processing more than a few deer at a time or a couple of cows? Spend the extra “moo-lah”. But if you are just grinding meat for a small family, this one will do fine. Starting from the top left you have the grinder itself. Already attached to it on the left side is the feeding tube. On top of the feeding tube, is the hopper. Moving on down, on the bottom left you will see a meat pusher. That’s pretty self-explanatory. 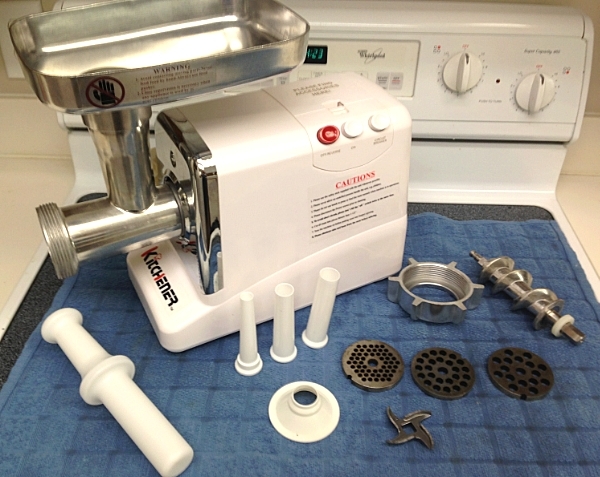 This grinder also comes with 3 different size plastic stuffing tubes and a stuffing plate. On the right hand side, you will see the metal parts. There are 3 different sized grinder plates, a grinder knife (kind of looks like a Chinese star), an auger (pushes meat through the feeding tube and into the knife and blades and finally a locking ring. Not pictured is a kubbe attachment. If you don’t know what kubbe is, don’t feel bad. Neither did I till I looked it up this morning. Apparently, it’s a Middle Eastern dish, typically a cylindrical-like shell made of meat and stuffed with a spiced minced lamb filling. I have no idea how well the kubbe attachment works, but now I am curious. Might have to experiment with it no that I know what it’s for. Anyway, more than enough to get you started grinding and even stuffing your own sausage, should you choose. One word of warning about the grinding plates, from the ones I have seen, they are all made of carbon steel. I won’t say whether that is a good or bad thing, but I will offer some advice. Carbon steel rusts if you don’t take care of it. That is not a big deal and easy to prevent, however. When done grinding your meat, thoroughly wash and dry the grinding plate. Then spray it with cooking spray or rub it with some type of cooking oil. Then wrap it in paper towels and seal it an a zip-lock bag and you will have no problems with rust. I do the same thing with the knife even though it’s supposed to be made of stainless steel. Better safe than sorry. I will mention that I looked up the LEM #8 this morning for comparison and it only comes with 2 different sized grinding plates and one stuffing tube. That might be something to consider when shopping around for a grinder. Not all grinders come with the same accessories. Grinders rock, ya gotta admit that. Fresh ground beef and home made sausages…how can you beat that? My grinder is an attachment for my Kenwood Chef (you can get them for other stand mixers too, which is a cheaper option if you already have a mixer. It works like a dream. Very good point which I did not bring up. They do make them for models like your Kenwood Chef and Kitchen Aid, but from what I have heard the plastic ones from KA don’t work well. Yours looks like better quality being made from metal. Thanks for the comment. Yes, it works really well, is very sturdy and efficient. I wouldn’t want a plastic one, especially if using sinewy meat. I store our grinder die in a zip top bag with about 1/2 cup rice which keeps them dry and rust free.